What do you get when you have to make quick real-time strategy decisions off the top of your head at any moment? Well you get a real-time strategy game of course. Well how about when you have to make quick real-time strategy decisions off the top of your head at any moment while also participating in the battle yourself? That's when you get a real-time strategy action game, or better known as Battalion Wars for the Nintendo Gamecube. Today's gaming developers always seem to release realistic (or at least semi-realistic) war games that focus on either the past or the present, for instance; SOCOM 3: U.S. Navy Seals, Call of Duty 2, and America's Army. However, it has been a while since a developer has come out with a war game based solely on their imagination. Battalion Wars has nothing to do with Iraq, or Vietnam, or even World War II. Instead it pits two imaginary countries on the brink of war against each other. The two countries, The Western Front and The Tundran Empire, have had a shaky peace treaty between each other for years. Each end has been itching for the other side to make the first move over the de-militarized zone, and move them into a full out war. Things seem to be turning around with the Tundran leader Tsar Gorgi hands over control of his army to his son Marshal Nova; however, Marshal Nova wants peace for the two countries instead of war. Tsar doesn't like this and sends his army over the de-militarized zone creating war between the two countries. After fighting each other to a standstill, a madman and leader of Xylvania, Kaiser Vlad unleashes his monster army on both of the weakened countries to take them over. Desperately, The Tundran and Western Front's armies form together under an alliance to fight him back. The Western Front sends you out on your first mission, (or tutorial) that's when they find out that a Tundran spy has overstepped his bounds. While your following him, Brigadier Betty (the games own Barbie doll) tells you what to do through her constantly smiling mouth and preppy bouncy cheerleader voice. At the end of the first mission its clear that the Tundran's have obliviously started the war. Battalion Wars has only one game mode unfortunately, and that is story mode. You control the guys in green or the Western Frontier, who, coincidently look and act very much like Americas army. Your main enemy is the guys in red or the Tundran Empire, who, also coincidently look and act much like Russians. In story modes main screen, you get an overview of a map with it split in half, half the map is colored in green (Western Front territory) and the other half is colored red (Tundran Empire territory). From there you get a small blinking red dot showing the next mission and its relation to the map. From there you can select the mission you are on, or go back and replay a previous mission to try and get a better score. Each mission you go on pits your small force of men (usually ranging from 6 to 12 guys at the begging, but then gaining more as you progress across the map) against the larger force of the enemy. You must use your brain in this one or you will lose all your units and, obviously, lose the battle. At the end of each mission, if you're able to complete it, you get scored and ranked. When you complete the game you unlock bonus missions depending on your overall ranking in the game. During each mission you get radio calls from General Herman, Brigadier Betty, and Colonel Austin, giving you hints, help, and your objectives. Battalion Wars gives you a wide variety of three different unit classes to use in your missions; infantry, aircraft, and vehicles. Under the infantry class are six units; Rifle, Flame, Bazooka, Missile, Assault, and Mortar. Aircraft offers you five armored flying machines; Gunship, Fighter, Bomber, Transport, and the Strato Destroyer. Finally, the vehicles give you the largest selection of units, approximately seven; Light and Heavy Recon, Artillery, Light and Heavy Tank, AA Vehicle, and Battlestation. Each one of these units has their strengths and weaknesses, giving you an advantage but the enemy an advantage as well. Not to mention that the AI is smart and reacts quickly to what you throw at it. The game gives you a great feel of control, allowing you to give orders to your units with the press of a button. You can tell your units to follow you or send them off to attack with just the press of a couple buttons. Moving and shooting is easy enough, just use the control stick to move around, you can lock onto an opponent and shoot him just with the L and A buttons. Yet the targeting system targets everything but the opponent, I often found myself having to re-target something because instead of targeting the opponent I targeted my own troop. With the ability to hop behind the wheel of any vehicle in the game, comes a hard to handle controls for them. The cartoonish CG graphics incorporated with the game, gives it a fun feel to it. For this type of game, the graphics allow for comical rag doll affects. However the graphics could have been improved a little bit, giving it more realism with moving body parts. Music in Battalion Wars is the one war song played in the background that loops every three minutes. However, the voice acting and syncing couldn't have been better. Especially, Brigadier Betty's voice, with her preppy Barbie doll acting, the high-pitched valley girl voice fits her perfectly. Sadly, (for most people expect this from GC games) Battalion Wars does not have a multiplayer mode in it at all. Which brings some disappointment to most people. The game could have used a multiplayer mode, with one-person controlling one country and another controlling the other, or even going full out with a four-player game. In the end, Battalion Wars did a great job of bring together two genre's of gaming that are naturally hard to combine into a good game. However they could have improved on a number of things to make this game extremely good. So if your looking for a good, hard strategy game that will keep you entertained for a number of hours, be sure to pick this one up. I'm sure that by now, most of you have heard of Advance Wars for the GameBoy Advance and Nintendo DS. If not, Advance Wars is a turn based military game, pitting two sides against each other in military combat. The handheld titles boast incredibly fun turn based gameplay, and now it's time to turn that fun 3D, bringing Advance Wars to the GameCube. 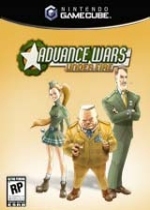 Originally, Advance Wars: Under Strike was to be a 3D version of the popular handheld series, until developers Kuju Entertainment and Intelligent Systems removed the turn-based gameplay and implemented a 3rd person action engine. The sum of it all became Battalion Wars for the GameCube. Battalion Wars is hardly your average 3rd person shooter. Kuju Entertainment added in some Real Time Strategy to the game to help make things interesting. This feature will actually provide you greater control over your units. Like most traditional 3rd person shooters, you pick your class and you go to town, simple as that. However with Battalion Wars, you will be able to use the C Stick to select any one of the units on your side, ranging from snipers to flame-thrower units. This flexibility allows you to change your strategy on the fly, depending on the situation. Unfortunately, even while I attended E3, I did not get a chance to actually play the game. Early video footage does show some smooth gameplay of what may be my personal favorite aspect of Battalion Wars; vehicles. You'll have a nice wide range of vehicles at your disposal, ranging from tanks to helicopters. One of the things about Battalion Wars that impressed me was how smooth the tanks looked. Most of the time when I'm cruising around in a tank (RIP Grand Theft Auto), it's super large and bulky, which makes for a very unresponsive vehicle. To compare the ease of control of the vehicles in Battalion Wars, I'd suggest looking at the popular LucasArts tile, Mercenaries. The vehicle gameplay in both games run a striking resemblance, which is good in this case. Battalion Wars will probably turn out to be like every other GameCube title, offering an incredibly fun multiplayer experience. As of this point, we're a bit unsure as to what type of missions we can expect, or even what kind of military types that are playable. Regardless, Battalion Wars will definitely follow Nintendo's "multiplayer-good times" suit, so if you're looking for a fun, multi-player military action game, look no further than Battalion Wars coming to your GameCube September 19th, 2005.